SilverTech Global Review 2019: Is SilverTech Global a Good Hosting? SilverTech Global is a small web hosting provider based in Argentina. They have expanded their offerings to public sector organizations and governments in developing countries. SilverTech Global is a small hosting vendor with headquarters in Buenos Aires, Argentina, where they have more than 785 customers, 1287 hosted websites, and 3271 email accounts. They have a presence in other countries around the world, and they have expanded their offerings to public sectors and governments in developing countries. SilverTech Global’s services include shared hosting, dedicated server, VPS, and cloud hosting solutions. Their website is available in Spanish, but I found that it can be switched into English simply by replacing ‘/es_us/’ (if present) at the end of its website URL with ‘/en_us/’, but none of their website’s language-changing buttons appear correctly make this switch. The Linux KVM VPS is built on modern cloud technology to provide powerful, flexible, and easy-to-use VPS hosting services. Also, the VPS servers come with the latest cPanel control panel. The G Suite solution comes with 30 GB storage, strong data encryption, and multi-factor authentication. The WordPress hosting package includes features like dedicated vCPU (that makes it virtually impossible to experience downtime), dedicated RAM (for faster delivery of data from servers), and SiteLock intelligent firewall (to protect the website against malware). 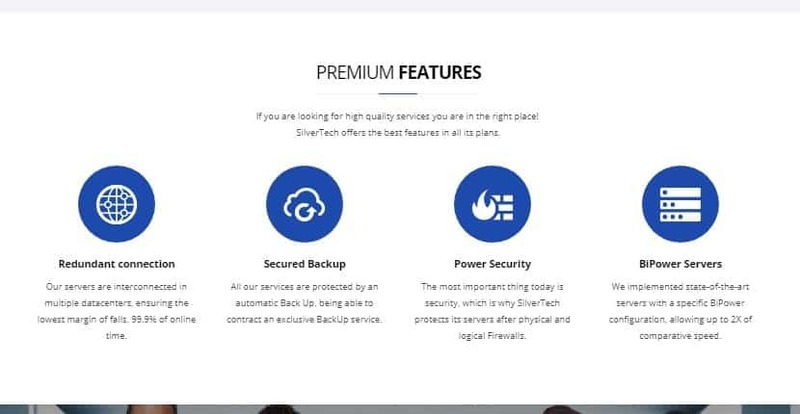 SilverTech Global does not offer upgrades or downgrades of their VPS server solutions, so users have to switch to another VPS plan in order to get more resources. Additionally, they do not include a backup feature, and in fact, they state in their policies that users are responsible for their own backups and data recovery in the event of a data loss event. SilverTech Global’s own servers are housed in data centers located in Los Angeles (U.S.) and Buenos Aires (Argentina). They also have data center partners all over the world – including Europe, Asia, and the Middle East – to better serve visitors in their own localities. SilverTech Global’s plans are competitively priced compared with other Argentinian hosting companies, but their advanced VPS solutions are quite expensive. Prices are displayed in dollars on their website, and customers can choose to pay for various periods: one month, three months, one year, two years, five years, or ten years. They offer free domain transfer and a money-back guarantee of 10 to 45 days depending on the chosen hosting plan. They also offer a 99.95% uptime guarantee, but they don’t provide a compensation plan for network downtime. Subscribers to SilverTech Global’s services can contact their polite and knowledgeable 24/7/365 technical support team via telephone, email or social networks. They also have a ticket support system and a limited website FAQ section, but no live chat. SilverTech Global is an ideal hosting provider for businesses looking for speed, efficiency, and reliability. The main problem with this vendor is that they don’t have a backup system, which means customers might have to engage with another company that provides this service. Wondering how SilverTech Global stacks up against other Web Hosting companies? Enter any other Web Hosting company and we will give you a side-by-side comparison.